Welcome to the First Church of Christ in Mansfield, the oldest church in Tolland County. 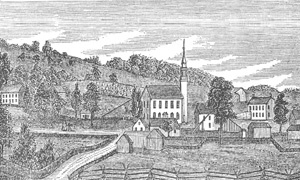 In eastern Connecticut, only the Congregational churches of New London, Norwich and Windham came earlier. Reverend Eleazar Williams and nine proprietors - Shubael Dimmock, Joseph Hall, William Hall, Samuel Storrs, Thomas Huntington, Benjamin Hall, John Sargeant, Samuel Stetson and Isaac Hall - formally organized the church by adopting and signing a Confession of Faith on October 18, 1710. During its long history, the church has been fortunate in having many outstanding men and women as pastors. The Reverend Eleazar Williams and the Reverend Richard Salter, the first two distinguished pastors, served successively for the first seventy-seven years of the church. There have been a total of twenty-seven pastors and nine interim pastors through the years. 300 Years of Faith in Action! In June 1894, the church was incorporated and a constitution was adopted. Significant changes and amendments were made over the years. 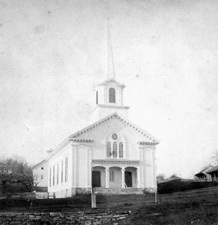 In 1894 the church was called The First Congregational Church of Mansfield. The original name, The First Church of Christ in Mansfield, was once again adopted in 1946, expressing more exactly the position of the church as a community church. Along with many other Congregational churches, this church merged with the Evangelical and Reformed church and became part of the United Church of Christ in 1957. The first meeting house was located near the old town pound on the north side of Brown's Road. This building was used until 1754 when a second meeting house was built on the site of the present church. That second meeting house was destroyed by fire in March of 1866 and the present building, designed by Edwin Fitch, was subsequently erected in that same year. Many changes have taken place since. The steeple, destroyed in the September 1938 hurricane, was replaced. A major alteration and redecoration of the sanctuary took place in 1949. A new Parish House was constructed and ready for occupancy in March 1957. There was another redecoration completed in 1989 which restored the sanctuary to its present simple beauty.